Bayern Munich welcome Stuttgart to the Allianz Arena on Sunday afternoon for a vital Bundesliga clash for both sides. Bayern are desperate for three points as they continue to chase down the leaders Borussia Dortmund, who remain six points ahead with just 16 games to play. Niko Kovac's side have been under pressure since the beginning of the campaign and find themselves in usual territory having captured the title with relative ease the past six seasons. Stuttgart require three points for very different reasons as they have struggled for consistency all campaign, leaving them just three points above the dreaded drop zone. Die Roten have lost more games (12) than anyone else in the league and were defeated once again last weekend at the hands of Mainz, after returning from the German winter break. ​Bayern were missing five squad members from full training on Wednesday as they prepare to take on Stuttgart without a number of key players. Arjen Robben and Franck Ribery both missed Bayern's 3-1 win over Hoffenheim last week, with the latter ruled out for Sunday. However, there is encouraging news for Robben, as he may be fit enough to take a place on the bench. Corentin Tolisso and ​Serge Gnabry were also unable to train, making their participation this weekend unlikely. The other notable absentee was ​James Rodriguez - who is fully fit - however, a Premier League move has been heavily rumoured during the past week, which may have unsettled the Colombian. Rodriguez has fallen out of favour under Kovac in recent months, increasing speculation he will leave Bavaria in January. Stuttgart will be without World Cup winner Benjamin Pavard, who misses out with a thigh strain. The Frenchman is Munich bound come the end of the season after recently agreeing a €35m deal with the German champions, but will be a big loss for Sunday's meeting against his future employers. Holger Badstuber is also unavailable for the away side after suffering a muscular injury during training this week, leaving Stuttgart bare boned in defence. ​Bayern Munich ​Neuer; Kimmich, Sule, Hummels, Alaba; Martinez, Thiago; Muller, Goretzka, Coman; Lewandowski. ​Stuttgart ​Zieler; Castro, Baumgartl, Kempf, Sosa; Ascacibar, Aogo; Esswein, Gentner, Zuber; Gomez. The pair have clashed 32 times over the years, with Bayern unsurprisingly boasting the better record. Munich have recorded 24 wins, whilst Stuttgart have managed just five victories in a fixture that hasn't been kind to them in history. 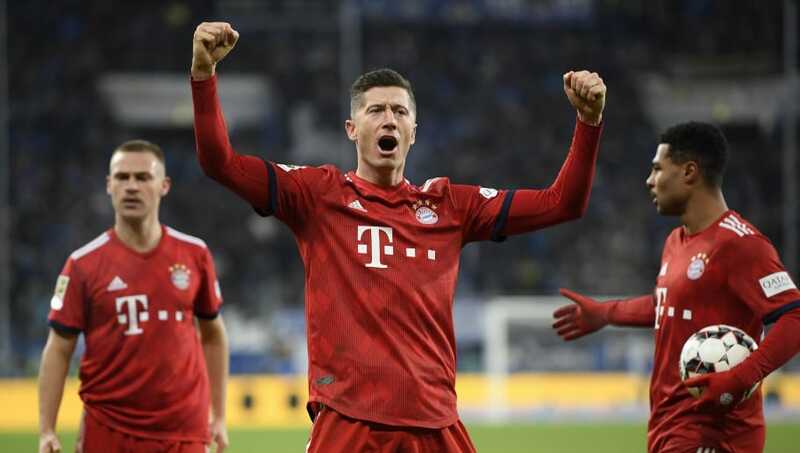 Their most recent meeting was back in September when Bayern ran out comfortable 3-0 winners courtesy of goals from Leon Goretzka, Robert Lewandowski and ​Thomas Muller. After a sticky start to the season, Kovac has guided Bayern back into a rich vein of form over the past six weeks. After defeats to Borussia Monchengladbach and Dortmund, as well as failing to pick up three points against Freiburg and Fortuna Dusseldorf, Munich's season was threatening to unravel. However, the German champions have looked close to their ominous selves over the course of their previous six games. They have picked up the maximum 18 points, scoring 16 goals in the process. After defensive struggles at the beginning of the campaign, they look far more solid and have conceded just two goals in those games, putting them in good stead for Sunday's meeting. Stuttgart's recent form tells a very different story as they have lost four from their last five, conceding goals for fun. They have the second worst defensive record in the league having seen 38 goals go in after 18 games, meaning head coach Markus Weinzierl is under huge pressure after Die Roten managed an admirable seventh placed finish last season. Their woes haven't been confined to defence either, having scored the fewest goals in the Bundesliga. Sunday could provide the perfect opportunity for Stuttgart to show their quality as they have nothing to lose heading to the Allianz Arena. It is hard to envisage anything other than a seventh straight win for Bayern come Sunday. Their recent form has been sparkling with goals coming from all over the pitch. Lewandowski has had the considerable goalscoring burden placed on him eased over recent games, making Bayern all the more dangerous. With Bayern flying and Stuttgart seemingly sinking, it would appear a banker home win. However, as we've seen before this season, Bayern are capable of slipping up at home against the so-called 'lesser' opposition.